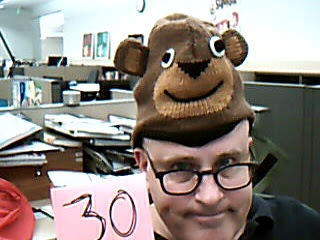 Day Thirty / Hat Thirty: Knit bear cub cap, 100% wool exterior, polyester interior, courtesy of the ever-bountiful Noelle Carter Headgear Archive. I dedicate today's hat to my niece and goddaughter Alizabeth, affectionately known around the family as "Ali Bear," who turns 21 years old today. Although she's now reached the age where any potential godfatherly duties are less legal responsibility and more opportunity to do Marlon Brando impressions at family functions, I'll always feel a certain responsibility for -- and renegade kinship with -- my brother's youngest cub.